Once a year I like to try to photograph one of every moth species seen during one night of intensive mothing. Since it was National Moth Week and conditions were warm and humid on July 22, I decided that would be the night. July 22 is also my birthday and as a bug geek, I couldn’t think of a better way to celebrate. Usually my first check of the lights doesn’t produce much but when I’d photographed more than 80 species before 10:15, I knew I’d picked the right night for my count! During the heat of summer, I generally check my lights at 10:00 P.M., 11:00 P.M., and Midnight. 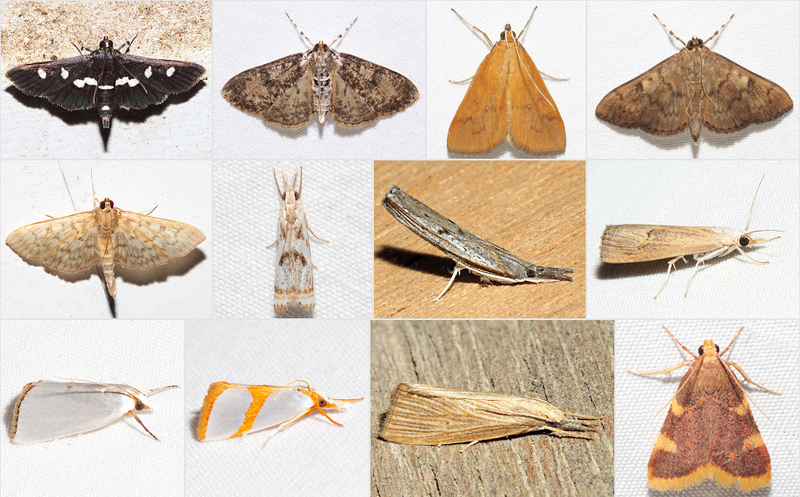 For this project I added one more check at 3:00 A.M. and ended up photographing 212 species of moths. Here’s my Picasa album documenting the final results. My goal was to try and get a photographic record of each species so many of these moths were not in very good condition and I didn’t go out of my way to try and get particularly good photos. This is simply a visual record of what I saw during one good night of mothing. All photos were taken on my farm here in west Tennessee on 7/22/14 and 7/23/14. The top bulb is a 160w MV and it’s right at the outside edge of a shed that I use for hay storage. The sheet is 5 feet inside the shed so it’s mostly protected from the weather. It’s supported on some thin rope strung across the supports of the shed with a pulley on one side to adjust the tension. On the front of the sheet are 2 x 40w white black lights and 1 x 15w black light. On the back of the sheet are 2 x 13w CFL black lights. To the right and behind the sheet is a sheet of cheap plywood paneling with the unfinished side exposed and on that I have a 13w CFL black light and a 15w tube black light. This shed is actually 2 x 20′ carports put end to end and the sides towards the back are plywood and some old rusty metal roofing panels with lots of gaps which allows plenty of bug access. The wood and rusted metal make for interesting backgrounds for many of my photos. It’s surprising just how many moths stay at the fringes of the lighted area. There are species that I rarely find on the sheet but can be relatively common in the back of this shed. My main moth photo albums can be found here. The majority of the moth photos were taken within 100 feet of my house here near Henderson, Tennessee. As of this writing, I’ve identified 1267 species of moths on my property and have photographs of another 100 or so species that I haven’t been able to identify, at least not yet. If you are located in eastern North America, please use these albums as a resource to help identify your moths. I can’t guarantee all the identifications are correct so if you think you’ve found a match, double check the ID on the Moth Photographers Group and Bug Guide. 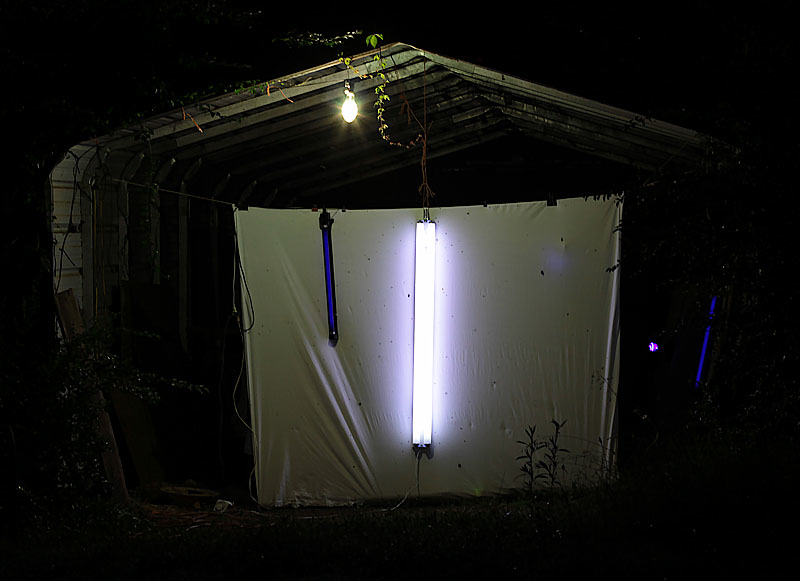 This entry was posted in Light Set-Up, Moth Identification, Mothing, Photographing moths. Bookmark the permalink.